Brett M. Kavanaugh becomes the next Supreme Court Justice. 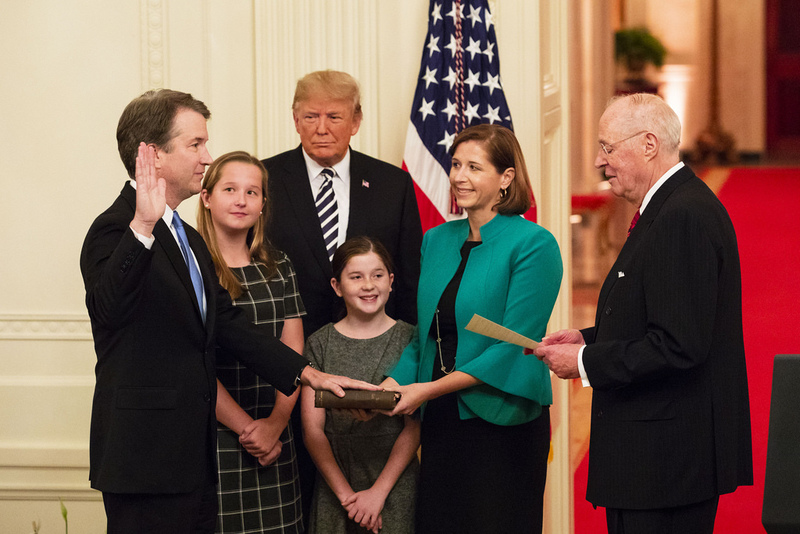 Supreme Court Justice nominee Brett M. Kavanaugh was officially sworn in as the ninth justice on Monday, Oct. 8 at the White House. The ceremonial swearing-in ceremony featured Kavanaugh and his family along with President Trump and every member of the Supreme Court. This is just days after a week long investigation by the Federal Bureau of Investigation (FBI) concluded that there is no substantial evidence of the sexual assault allegations made against him by Dr. Christine Blasey Ford. Kavanaugh was on the list of potential Supreme Court Justice nominees, picked by Trump, in late June to replace retiring Justice Anthony Kennedy. In early July, Trump chose Kavanaugh as his official nominee to replace Kennedy. During this time, Ford sent a letter to her state senator and even met with her state representative to discuss her allegations of sexual assault against Kavanaugh. She accused him of sexually assaulting her at a party while they were both in high school. This was hidden from the public and the press out of respect for Ford. After the confirmation hearings for Kavanaugh, reports of the letter sent to her state senator surfaced and eventually she came forward to the Washington Post. In September, both Kavanaugh and Ford testified in front of the Senate Judiciary Committee, who decided to conduct an FBI investigation to gain more information. In the end, Kavanaugh was approved as the 114th Supreme Court Justice with a close vote of 50-48 by the Senate. His confirmation sparked outrage throughout the entire country, especially by women who were inspired to tell their own sexual assault stories after Ford testified. A day after his confirmation ceremony, Kavanaugh joined the Supreme Court bench with the other Justices.